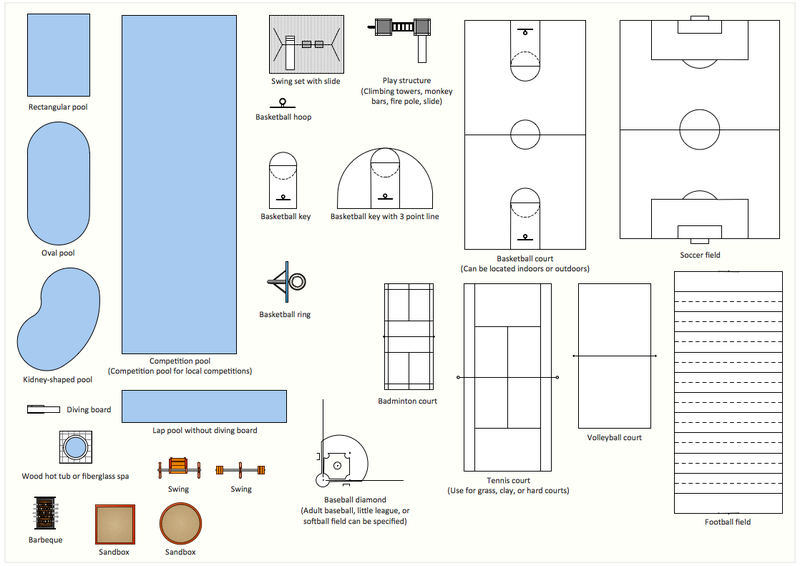 The vector stencils library Sport fields and recreation contains shapes of sport fields and recreation equipment and design elements for ConceptDraw DIAGRAM diagramming and vector drawing software. Use it to draw sport fields and recreation plans and equipment layouts. This design elements library is included in Sport Field Plans solution from Building Plans area of ConceptDraw Solution Park. Use ConceptDraw DIAGRAM diagramming and vector drawing software enhanced with Building Plans solution to draw your own site and floor plans, design and layouts of sport fields and recreation areas. The kitchen is one of the important places of the house, and so the kitchen planning is a very responsible moment. The kitchen must be comfortable, convenient, harmonious and aesthetic. ConceptDraw DIAGRAM v12 diagramming and vector drawing software offers the Floor Plans Solution from the Building Plans area of ConceptDraw Solution Park to help you create professional looking Kitchen Plans of any complexity.